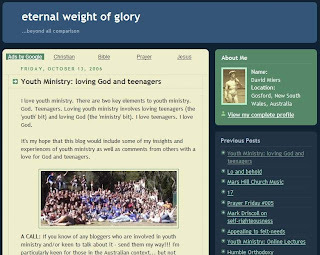 It was on May 10 AD2006 that eternalweightofglory went public. In 2002 I had a blog named slightmomentaryaffliction - but didn't really use it. So in 2004 I made a new one with the positive side of 2 Cor 4:16-18 as the title - but I didn't really use it either. So in May 2006 after some umming and arring - this blog went public. Here are the early posts from May AD2006. The memories. My aim over the next year is to talk about Jesus more. >insightful - not bad... could be better.